A normally open start and normally closed stop pushbuttons are used to start and stop the process in automatic mode. Upon starting the entry conveyor will bring a part to the item at entry sensor. The conveyor will then stop. 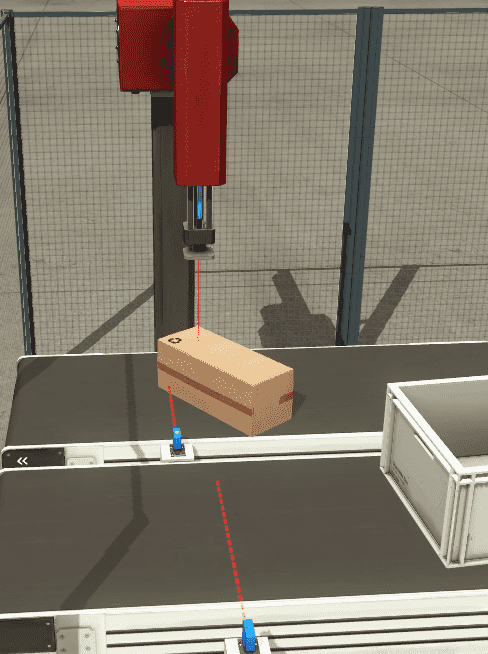 A robot arm will move down, detect the part and then active a grabber. It will then return to the up position. When it reaches the top it will extend the arm over the opposite exit conveyor. The exit conveyor will be stopped as the arm lowers the part to the conveyor. It releases the gripper and moves back up. The exit conveyor can then start. The arm returns to the entry conveyor. The entry conveyor will start again, to continue the same cycle. 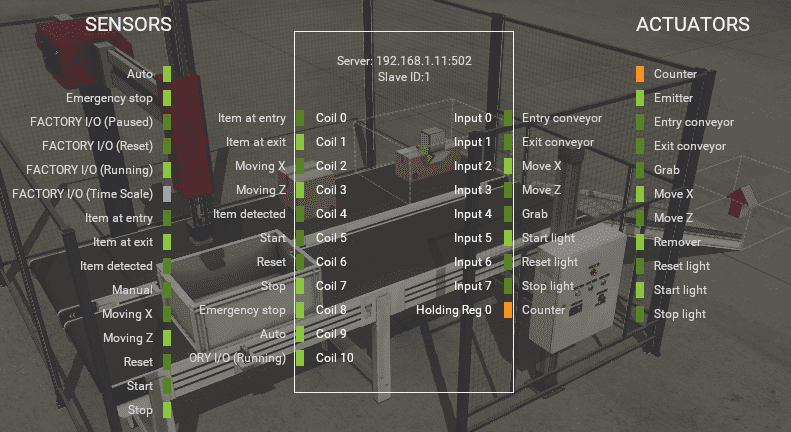 Upon a box being sensed from the item at exit sensor a counter will keep track of the number of complete cycles. The reset input will reset the cycle counter and the machine. All items are removed off of the conveyor belts. 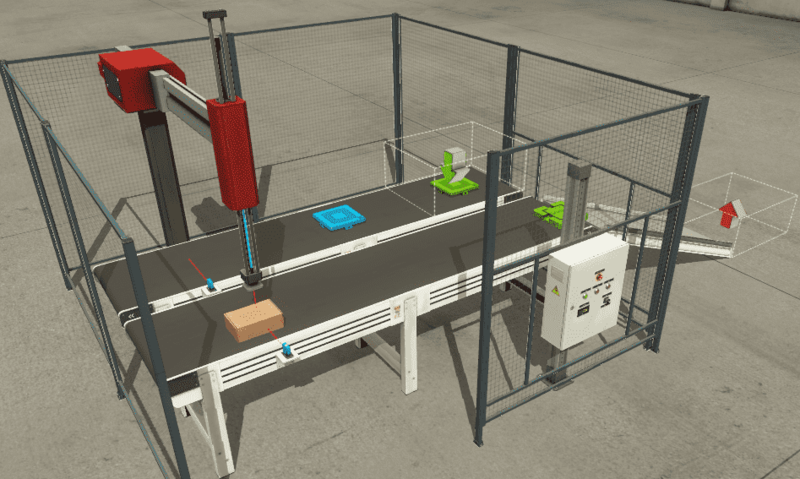 The manual mode will allow the function of the robot arm to step through the sequence without the conveyors running. If the sequence stops for any reason, an error number will be displayed indicating where to look for the error on the machine. Here is our sequence of operation for our pick and place application. 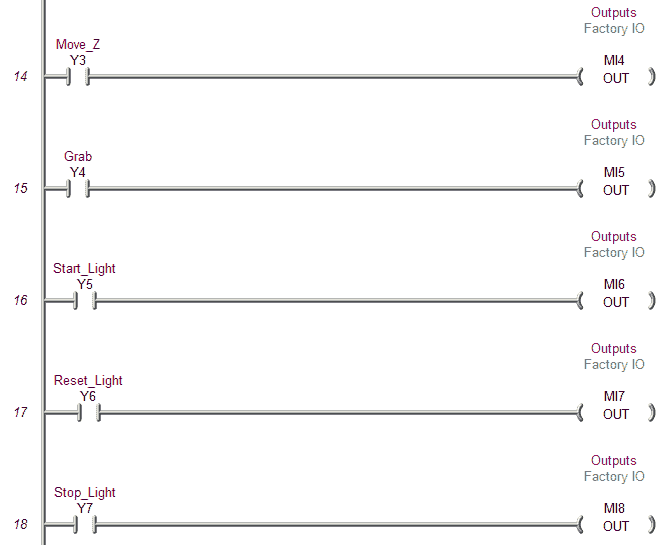 If our input conditions are true then the outputs are set. 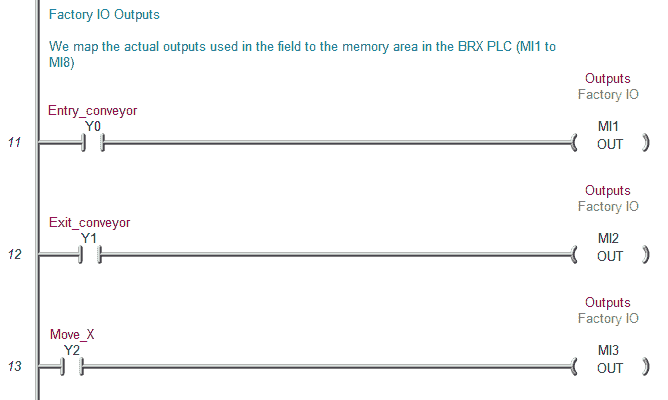 It will then look at the next step for the input conditions to set the outputs. Etc. The first thing in our program is to control the start and stop functions. This is done through a latching circuit. You will see in the sequence table that I have included a start bit. This is because the start pushbutton is momentary. Inputs to our input word will now be programmed. This will allow us to view a register and compare it to a predetermined list. 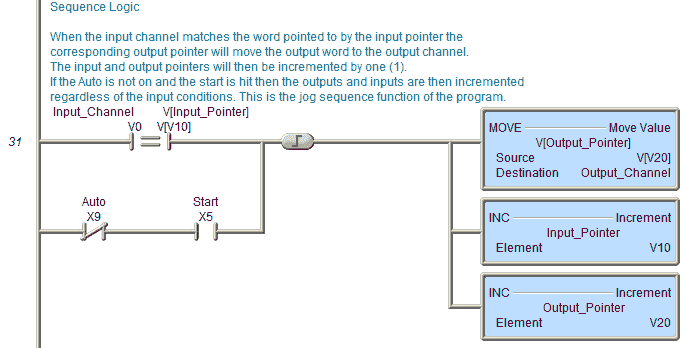 When the input channel matches the word pointed to by the input pointer the corresponding output pointer will move the output word to the output channel. The input and output pointers will then be incremented by one (1). 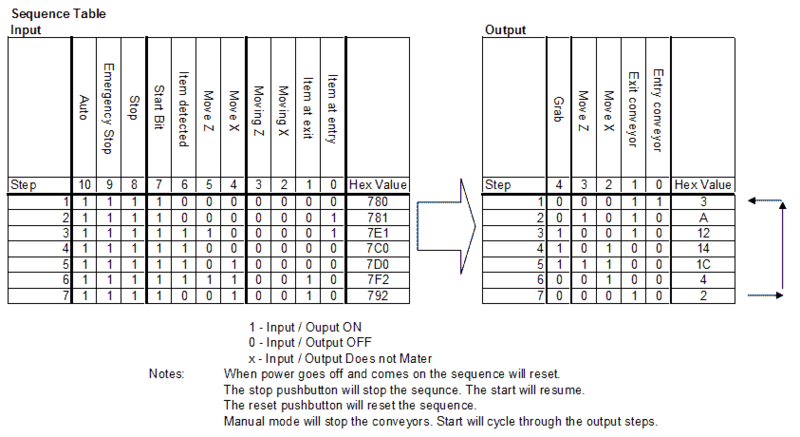 If the Auto is not on and the start is hit then the outputs and inputs are then incremented regardless of the input conditions. This is the jog sequence function of the program. 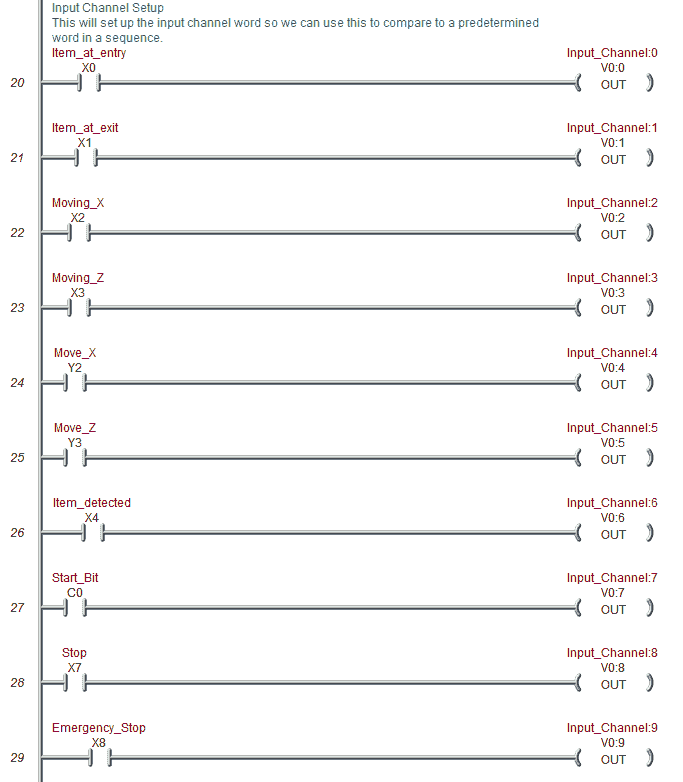 The sequence will be reset by moving the default values into the input and output pointers. Resetting the sequence is done by going past the last input pointer location, first scan of the program or the reset input of the line. 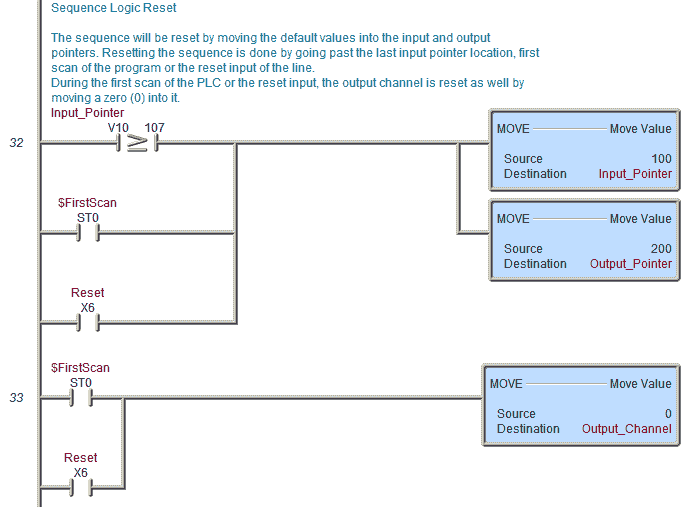 During the first scan of the PLC or the reset input, the output channel is reset as well by moving a zero (0) into it. This will set up the output channel word so we can use move this from a predetermined word in a sequence to the actual outputs. Note that the start bit must be on for the entry and exit conveyors to work. This way we can jog the process without the items on the conveyors moving. The lights are separate from the output channel because they are set by the start bit only. The reset light is controlled by the reset pushbutton. The counter will increment by one (1) when an item is at the exit. This is a one shot input so it does not count multiple items for the same package. 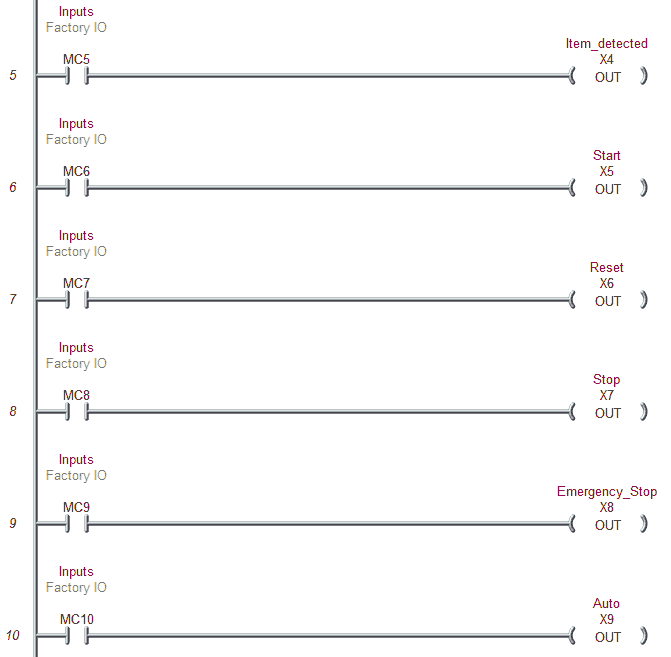 When the following errors occur they relate to the following input (output) conditions. This will give the operator an idea of what the error is related to on the application. When the start bit is on and the input pointer is greater than the first location, compare the input channel with the input channel table. After 10 seconds, display the error. 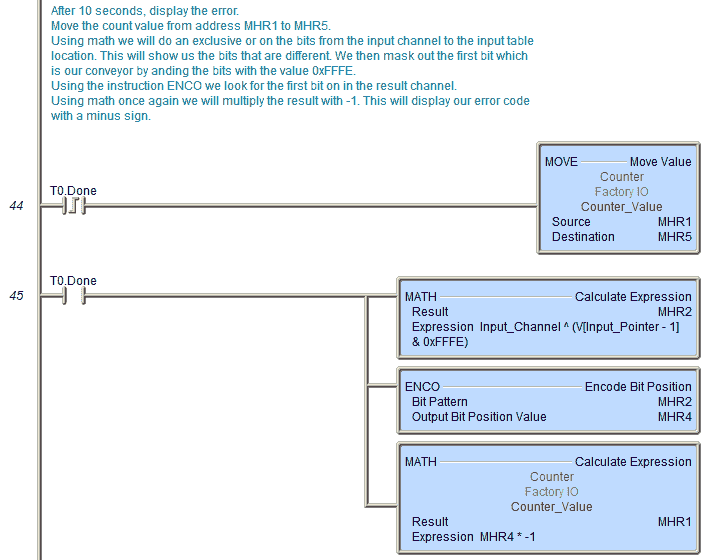 Move the count value from address MHR1 to MHR5. 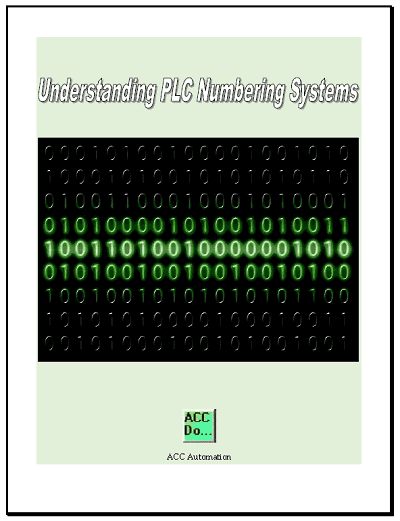 Using math we will do an exclusive or on the bits from the input channel to the input table location. This will show us the bits that are different. We then mask out the first bit which is our conveyor by anding the bits with the value 0xFFFE. 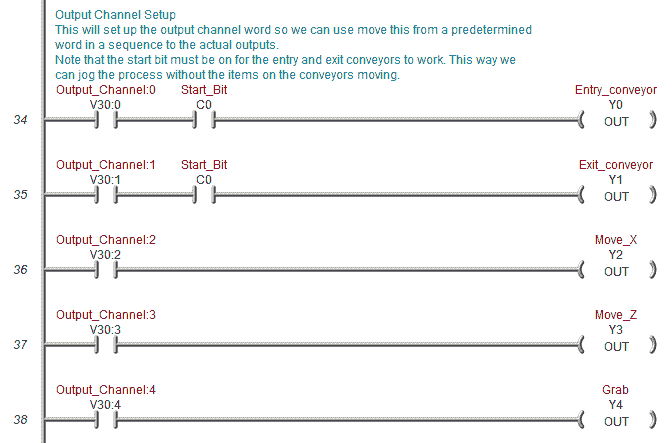 Using the instruction ENCO we look for the first bit on in the result channel. Using math once again we will multiply the result with -1. 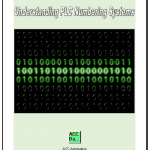 This will display our error code with a minus sign. When the error timer is reset, the count value is then returned to the display. 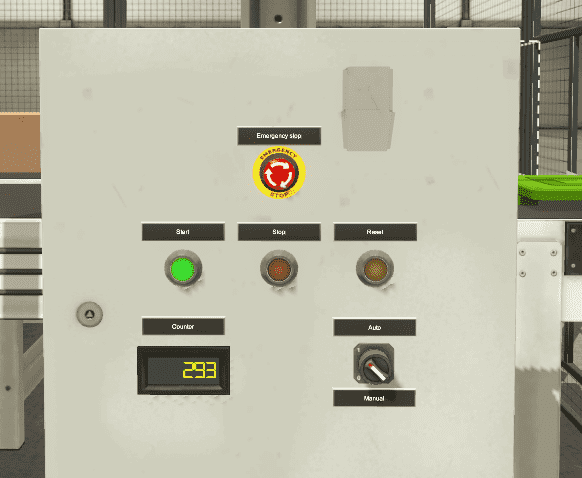 Next we will try our manual operations programmed into the process. If everything is working then we will start running our program in automatic mode. 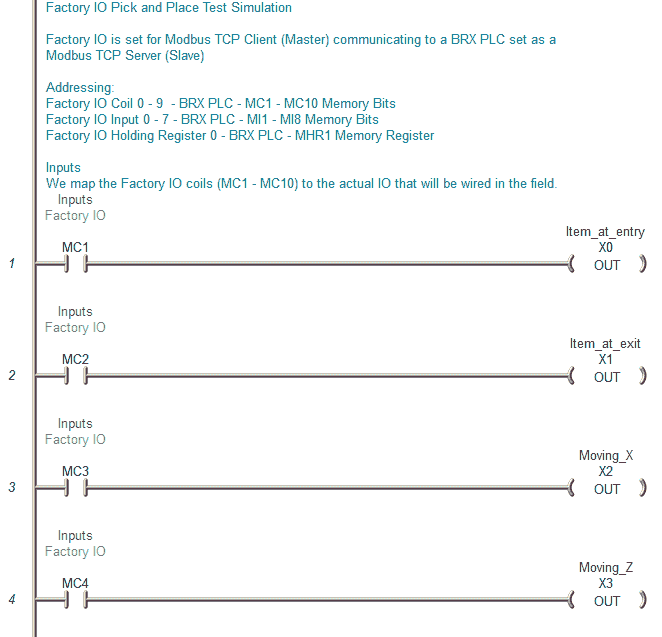 Watch the videos below to see an explanation and test of the program using Factory IO.